A couple of weeks ago, I wrote about one of the biggest hurdles Catholics have when it comes to fundraising. It’s the lack of confidence to ask for donations. In the next few minutes, you’re going to learn three tips from a French priest on how to actually improve your fundraising results. Hi, I am Brice Sokolowski, the founder of CatholicFundraiser.net, a website that is completely dedicated to helping Catholics just like you with their fundraising. Whether you are a lay apostolate, a religious order, a school, a parish diocese or just a one man, one woman, show – even a hermit – you are in the right place because thousands of Catholics are being helped with their fundraising through CatholicFundraiser.net. 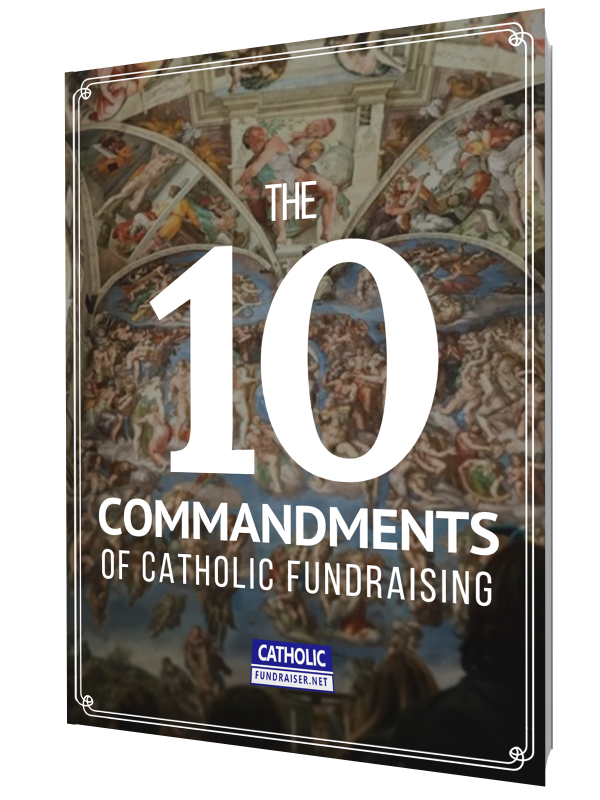 The first step they to take is to download the 10 Commandments to Catholic Fundraising Guide. It is completely free. This guide explains how to improve your fundraising from what I’ve learned on how to connect my Catholic faith with my fundraising. Also, it outlines what I’ve learned from the writings of saints, the writings of popes, studying theology, and combining all of this to help you move forward. All of this will help you do what you really want to do: your mission: saving lives and saving souls. Okay, with that set, let’s dive into this French priest. The priest that I am speaking about is father Raymond Thomas de Saint-Laurent. I stumbled because I wanted to say his name the French way. I have a little bit of affinity for this priest because I was actually born in France. If you haven’t heard of him before or you do know him and have information about him, just put a comment. I’d love to know more, but nonetheless, he was born in Lyon. If you see me pausing or looking to the side – if you are watching this on YouTube – or you hear me pause, it’s because I’m reading my notes which you can find on my website Catholicfundraiser.net. The link is right below along with the Book of the Ten Commandments. Fr Raymond Thomas was born in the nineteenth century in Lyon, was ordained, and had a very prosperous life, especially when it came to writing. He had a doctor of theology and published many books. One of the books that I came across recently is the book titled, The Book of Confidence. I love the title because he just says, ‘This is the book of confidence.’ You have to have a confident personality in order to write that title. This book is important because in fundraising you have to have a tremendous amount of confidence because it is difficult. As a result, I thought this is a fantastic book to help you with your fundraising and build that confidence because you have to ask people for donations. Therefore, here are three recommendations from his book of confidence on how to fundraise, improve your fundraising, or just get over those humps. The first recommendation is, and this is a quote from him, ‘Our Lord exhorts us now, as he did the Apostle long ago, to have confidence in him.’ You’ve got to have confidence. What is confidence? He quotes Saint Thomas of Aquinas: hope that is fortified by solid convictions. Hope is not an ordinary hope, common to all the faithful. It’s a fortified hope, and he even calls it a heroic hope. So when you have confidence, it’s bigger than probably what you already have. It’s bigger than what I have. You have to be really, really big on your level of hope. I believe the Catechism says it is the belief that God is working with you? Jesus is side by side. That’s hope. That is the theological virtue of hope from my memory. So you’re gonna have a growing hope that God is with you, Jesus is with you. He wants you to have confidence. And so that’s number one. Have confidence in God. Number two. What Father Raymond Thomas says is God provides for temporal needs. This is really important because we’re fundraising for needs. So I’m quoting him. Confidence is exercised by means of acts that are more intense and vibrant. So when you’re going around and doing things, even if it’s just with your mission. Go around with more intensity and tenacity, I mean, don’t pause. I see it often where people say, ‘I’ve got to fundraise in order to do A and B. No. You must be acting, taking action with a lot of confidence. And then he continues, ‘God knows that you have needs of all these things.’ God knows that you need things. Therefore you must believe God is going to take care of you. So go and take action. I keep saying to Catholics that they must not wait. Take action. And then the third recommendation. Father Raymond Thomas says, ‘God provides according to the situation of each one.’ This is when he lays down his gauntlet. What I mean is that we can’t assume that God just wants the basics for us. ‘Oh, we just need a little bit here and a little bit there.’ He’s not a God, if I can paraphrase him, of just getting by. Fr Raymond Thomas says that God employs great extravagance. We cannot limit ourselves thinking that God is not going to provide everything that we need. He really can. And Fr Raymond Thomas says, I don’t think that God is just going to give you a little bit just to get by. He’s all about extravagance, and at the same time, he provides according to our needs. So it really is dependent on you on figuring out what is it that you really need. Sometimes I get people asking, ‘Should I really fundraise?’ You have to figure that out. And once you figure out that out, the biggest step of them all (I said there were three steps), this is a big, big step that he says you should follow. Father Raymond Thomas says, ‘Confidence does not take away us the obligation of prayer.’ It’s not enough for us to wait for God’s assistance. We must also ask for it and we must take action. So take action in building your confidence, believing in God, moving forward with your mission and going out and saying, ‘You know what? I think God wants me to do more. I need to fundraise, therefore I need to go out and ask people.’ Ask God, and you’re going to get it. So hopefully I wasn’t a little too long. But there are a lot of golden nuggets. With that said, share this with your friends, a religious order, a Catholic organization that can benefit from it. Leave a comment. Let me know what you think about this priest, and God love you. Speak with you next week. Question: Which priest has given you great advice on how to raise funds? Please leave your comment below.